These three are the greatest treasures. I absolutely love this quote as it discusses a topic that is near and dear to my heart and something that I struggled with during my basketball career. Leadership. What is leadership? I wish I could give you a nice and succinct answer, but I cannot nor do I think anyone really can. Lao-Tzu’s description of his approach to leadership may seem to encapsulate ideas one may think are not that important but I would disagree vehemently. Simplicity is absolutely essentially to being a great leader. Champions are not won on the day of the game, but by all the tiny, seemingly inconsequential, tasks that are completed on a daily basis without failure. This moment is the most important, no matter how mundane it may seem. Patience and compassion are equally as important as nothing great is done quickly, it takes time and requires that you love the process. Mastery of all these traits means that you are truly living as fully as possible in the moment and loving the process. How would one take and apply this wisdom into their life? It is vital to remember that common action is NOT common knowledge and that all knowledge is dead unless it is acted upon. Sam wrote a great posts about mindfulness and being mindful and embracing what is, because that is life itself, is essential to mastering these three pillars of effective leadership. 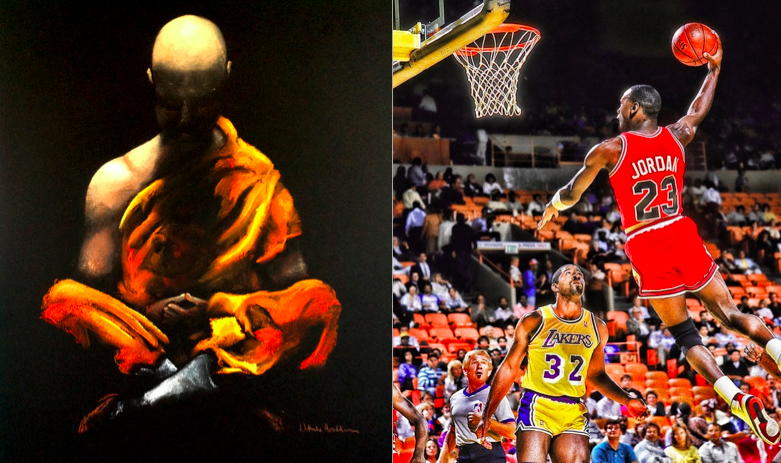 It may seem that this monk and Michael Jordan have nothing in common, but that could not be further from the truth. The share an intense like focus on what they are doing RIGHT NOW. You may exclaim meditation is not for me, and Michael Jordan did not feel he needed meditation. However, Jordan was a rare athlete in which he could instantly enter a state of laser sharp focus that many life-long zen practitioners would be jealous of once he entered intense competition. So if you do not want to meditate, how can you use mindfulness to help you better implement these strategies into you life? Pay attention to your breath. Whenever, you find you are ignoring the simple things in this moment, or you want the future to be NOW or are getting frustrated with someone. Step back, and pay attention to how miraculous and beautiful it is that your body knows when to breath without you even having to think about it! The breath is a wonderful portal from the world of form in the formless realm. Enjoy the process, and remember that excellence matters.